Got a party, event or big business do, no matter what the occasion you are sure to extend an invitation that highlights its significance. Ensure that your customized invitation printing is tailored to your requirements and that it creates excitement for whatever’s planned. 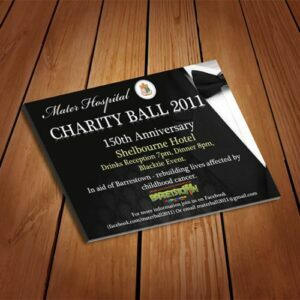 ClickPrinting.ie can supply you with a design that will suits any occasion whether its a corporate event or inviting people to a party or anniversary. Utilize our creative and expect knowledge to produce a design that will have you or your business the talk of the town. Available on an range of sizes, papers and finishes. Contact us today for more or simply choose from below.